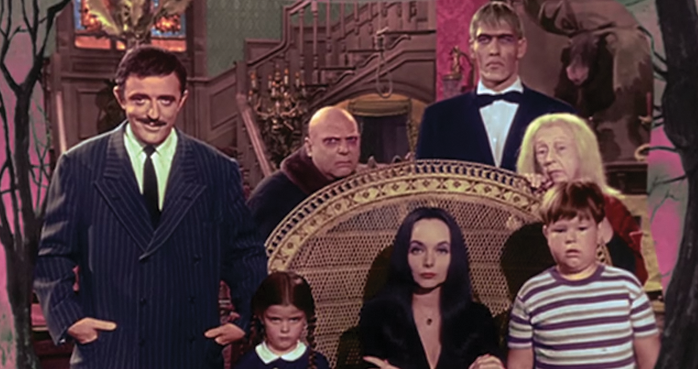 The Collinsport Historical Society: THE ADDAMS FAMILY ... IN COLOR! Stuart Manning, mastermind of the DARK SHADOWS NEWS PAGE, shared an interesting creation yesterday on Facebook. He's taken the original B&W opening titles for THE ADDAMS FAMILY and added a little color to the proceedings. And Manning did his research, letting color set photos from the television series guide his hand. While I'm not wild about seeing the Charles Addams framework in color, the video elements are accurate to the costumes and set decoration used in the series, which were a lot more gaudy than you might imagine. The interior design of 0001 Cemetery Lane looked like a pink nightmare, the kind of place that hosted more than one key party in its day. You can watch Manning's video below.